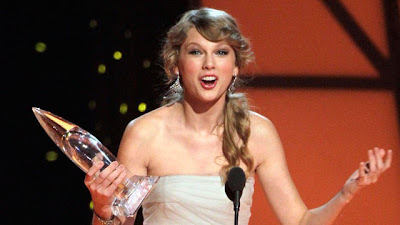 Taylor Swift wins her second consecutive 'Entertainer of the Year' award at the CMAs last night (she also won last year). Wearing a beautiful strapless gown, it is so fluid and figure hugging. She gives thanks in her speech to all the people who supported her on tour including Nicki Minaj, TI, Andy Grammer and many more. She ends her speech with 'Thank you, this has made my year'. She is currently finishing up on her tour and writing/ recording her new album, due to be released in 2012. Will her new album perform better than 'Speak Now'?